I have mostly been busy creating items for the gallery for the holidays the past few weeks. 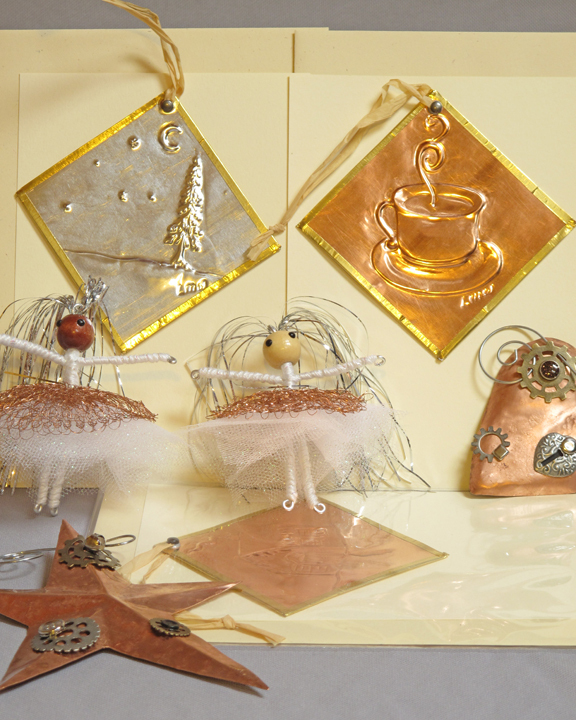 Along with new art doll sculptures this includes a few extra jewelry creations, and several types of ornaments. Even though these are smaller pieces that I make several of at a time, I do hand craft each as a distinct original piece. I think that my “ornament cards” illustrate this best. The small metal repouseé panel that is on each starts out as a piece of blank tooling foil. I sketch a design on each with a dry erase marker, and then use a variety of stylus tools to shape the design front and back to create a relief sculpture. A sparkly card stock backing is then attached by edging the two panels together with metal foil tape. With the addition of an eyelet, a hanging ribbon, and attached to a card it becomes both a greeting and a gift. I also forge copper stars and hearts from copper stock, and pierced aluminum. These are finished with a variety of found objects from my steampunk-y materials stash. This year I wanted to add an ornament with a nod to my art dolls. I created the little “snowflake dancers” you see in the photo. Each starts out with a wooden bead and a couple of pieces of twisted wire. 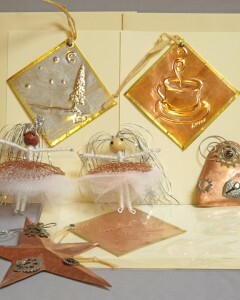 Brads for eyes, tinsel hair, a wrapped yarn leotard, and skirts of copper and tulle complete these miniature hanging dolls. My latest art doll is also a hanging piece. Following our first ever Juried art show at the Hillsborough Gallery of Arts (more on that in a couple of weeks); HGA will host “Art All Around” in January. This gallery group show will feature works that in turn feature circles. My piece for the show is “Cirque III”, she is the third in a series of aerialist dolls fashioned in the style of a “cirque” type circus. 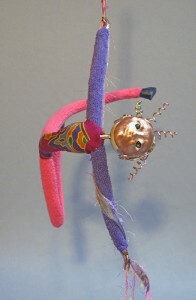 This doll I purposely balanced and positioned so that while hanging, the slightest breeze or air movement will cause her to move in a circular plane. This of course made photographing her all the more of a challenge, but I do like the effect. She will be in the gallery starting the last week of January. This entry was posted in Art Dolls, Art Shows and tagged art, art doll, Art show, ballet, cirque, copper, dancer, figure, figure sculpture, hanging sculpture, Hillsborough Gallery, holiday greeting, holiday ornaments, mixed media, North Carolina, one of a kind, sculpture, steampunk, the Hillsborough Gallery of Arts on December 16, 2014 by lynnadmin.